a judgment free, safe place to experience, connect, and heal with nature. Here you will find a chance to sit with the spirit, that is nature and Mother Earth, and some of her creatures. Our experience is that this connection is vital to well-being, and we are creating a peaceful place where people can experience a guided tour to meet Bowser, the American Black Bear who shares his amazing spirit to help us all contemplate a different perspective. You can also meet, feed, and get lost in the powerful presence of Billy & Bambi the American Bison, as well as several horses, and our wonderful pack of Great Danes. On Saturday, May 26, 2018 from 9:00 AM – 6:00 PM we will be beginning to build and plant a meditative park together, adding fencing, pathways, benches, and garden beds, as well as improving Bower’s pen both for his benefit and for the comfort of visitors. If you would like to help create the peace sanctuary, you can donate to our GoFundMe project. Watch the KFOR TV interview with Stanton Pace and Bowser at the link below or scroll down for transcript. 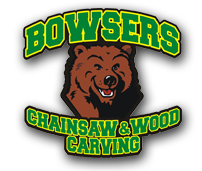 Bowser’s Woodcarving Tshirts available via email. Go Fund Me — Bowser’s Habitat. Supporters of Bowser’s Habitat may receive one-of-a-kind pieces created from Bowser’s fur or carvings by Stanton Pace. If you would like to contribute to developing Bowser’s Peace Sanctuary, you may write to me to order a spirit fur object. I have braided the spirit fur with leather or hemp (your choice). For jewelry, I’ve also added a small wooden end that latches through a looped end and a small adjuster bead for a snug fit. I’ve made other gifts with beaded feathers and other designs, and I will continue to make unique pieces and one-of-a- kinds. TECUMSEH, OKLAHOMA — Take a big chunk of black walnut and Stanton Pace likes to follow the grains and growth rings. They tell him most about what shape his carved animals might become. But Stan has something else few other carvers like him can boast, especially when it comes to carving bears. He has a live model, a 3 and a half-year old male, black bear named Bowser. The Paces bought him as a 5 week old cub. They raised him in their house until he got too big. After than they moved him to a luxury enclosure right next to where Stan does his carving. They spend a lot of time together, these two. When Stan needs a certain pose the treats come out. Full disclosure, I didn’t venture into Bowser’s area. Stan’s wife Shanna carried a miniature camera inside the fence. They tell us Bowser minds her better than he would a stranger. But when it comes to special relationships you won’t find one better than this artist and model. Model and muse together in one 500 pound package. Their connection is definitely unique. There’s a bit of him in every piece of wood Stan carves.